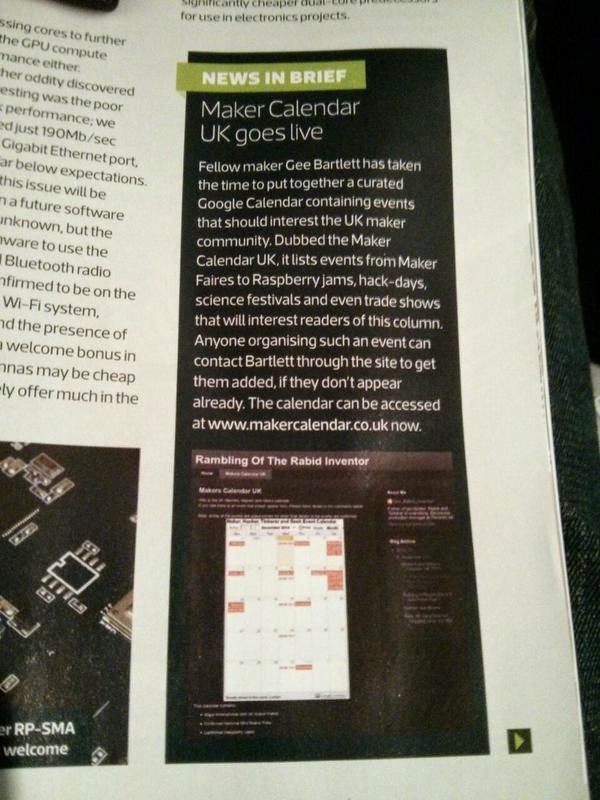 A Comprehensive Calendar of UK maker events and larger International Events. Sorry for shouting just really good news I have only been doing this since November 14 and having a mention in a national publication is a great boost towards making this great. But this is where I need your help if you know of any Geeky, Makery Nerdy or just down right Hacky events that are happening and not list here please let me know. This is going to be a little of good news bad news. I had better get the bad news out the way I was hoping to migrate to some hosted space this January with a WordPess or other CMS based blog engine with the calendar integrated nicely, unfortunately things haven't quite gone that way. Good news is that the Makers Calendar has its own Blogger blog and I have done my be to jig Blogger around to look nice and custom and hopefully usable. More info on the different types of events so a page for Hackspace regular meets a page with more info on what Maker Faires and Raspberry Jams.